ARTHUR FOOTE (1853-1937): 3 Pieces for Flute and Piano, Op. 31b, Nocturne and Scherzo for Flute and String Quartet, ROY HARRIS (1898-1979): 4 Minutes - 20 Seconds For Flute and String Quartet, CHARLES T. GRIFFES (1884-1920): Poem for Flute and String Quartet (arr. Anthony Granata), AMY BEACH (1867-1944): Theme and Variations for Flute and String Quartet, Op. 80. Description: Yes, we’re offering this just because of the little Harris piece of 1926 whose singing lines and modal harmonies foreshadow his mature works of the following decades. 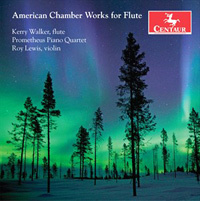 Kerry Walker (flute), Prometheus Piano Quartet w/Roy Lewis (violin).